Everybody enjoys a little surprise -- just ask Eddie Murphy...or Ronaldo...or Gavin Rossdale...or Chingy. For a surprise that's not a phallus, hit Custom Sword Canes. From a celebrated South African knife operation, these custom luxe walking sticks're built from top-notch materials, and handmade to conceal a blade, but not a Blade, as that'd get you put in jail. 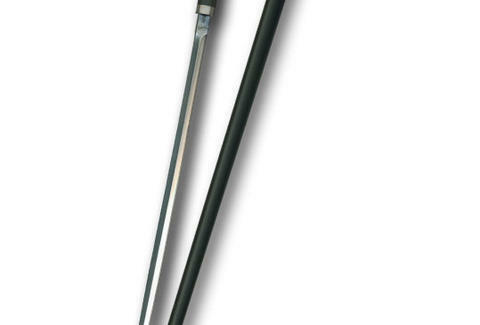 Standard models start with the "entry level" Mark 1, with a 17.5" long carbon nickel steel stabber housed within its black carbon fiber shaft, and get as advanced as the titanium-handled "Stiletto", sheathing a spring-loaded 12" dagger; most also come with a choice of handle style (ball, pistol grip...) made with materials ranging from silver to warthog ivory, though choose the latter and you can forget about your Halo. 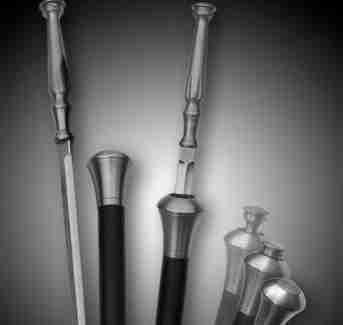 For further personalization, they'll hand-engrave just about any part of the cane, using free-hand script or a hammer & chisel design, plus you can upgrade via 24K gold inlays, or a blade cut from patterned Damascus steel, essential if you're Syrias about style. Due to being weapons of death, they even promise ultra-discreet shipping, and insure all purchases privately so there will be "no taxes or duties to worry about", because if you live somewhere they don't approve of pointy surprises, how will you ever be a Soulja Boy?